A versatile linebacker converted to a fullback, Rush dressed for 13 games in 2018 and contributed one tackle on special teams. He also remains one of the most-active players in terms of donating his time to charity and community events. Rush signed a two-year contract extension on January 4, 2019. Rush attended training camp with the Bombers in 2016, and returned to the club a year later. He dressed for all 18 games after converting from linebacker to fullback and chipped in with six tackles on special teams. 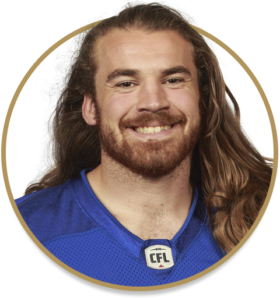 Rush was named a CIS All-Canadian and the Presidents Trophy winner in 2015 as the top defensive player in Canadian university football after leading the country with 60 tackles. He was a three-time team captain and the MVP of the OUA final in 2015. In his five years with the Guelph Gryphons Rush racked up 150 solo tackles, 129 assists, nine sacks, two forced fumbles and four interceptions. Rush was a OUA All-Star in his second year at Guelph; missed 2013 with a knee injury.